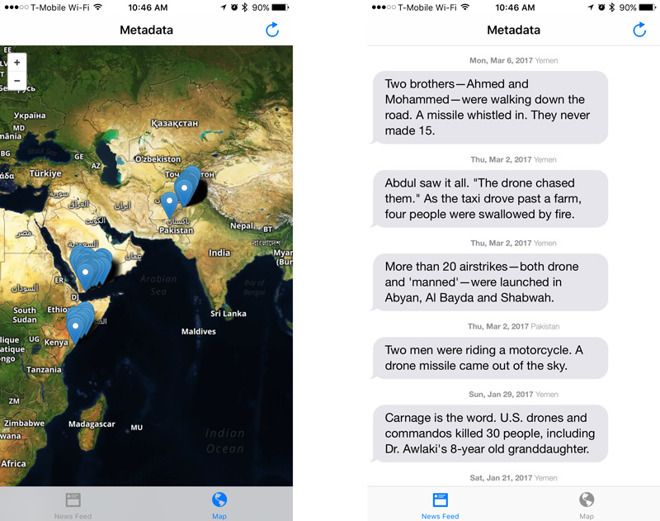 The app's return was highlighted by its creator, Josh Begley from news site The Intercept. It's not clear why Apple decided to reverse course on earlier policy. The app originated five years ago as "Drones+," but was rejected multiple times for "excessively objectionable or crude content," Begley noted. This is despite the fact that it doesn't include any graphic images, and simply logs attacks with a few short sentences, a pin on a map, and a push notification. In occasionally trying to resubmit the app, Begley at one point switched the name from Drones+ to Metadata+. It was finally accepted in 2014, managing over 50,000 downloads before being pulled in Sept. 2015. At the time Apple once again used the claim that the app contains "excessively objectionable or crude" content, that "many users would find objectionable." In the past Apple has tried to deter developers from using apps as a means of political expression, for instance rejecting apps about sweatshops or the Syrian civil war. The company could conceivably be loosening its philosophy in this area, or simply in respect to Metadata, which is sometimes critical of drone strikes but typically doesn't express an overt point of view. In its new incarnation the app requires an iPhone or iPod with iOS 10.2 or later. Update: Within a matter of hours, Apple has already taken Metadata back offline.